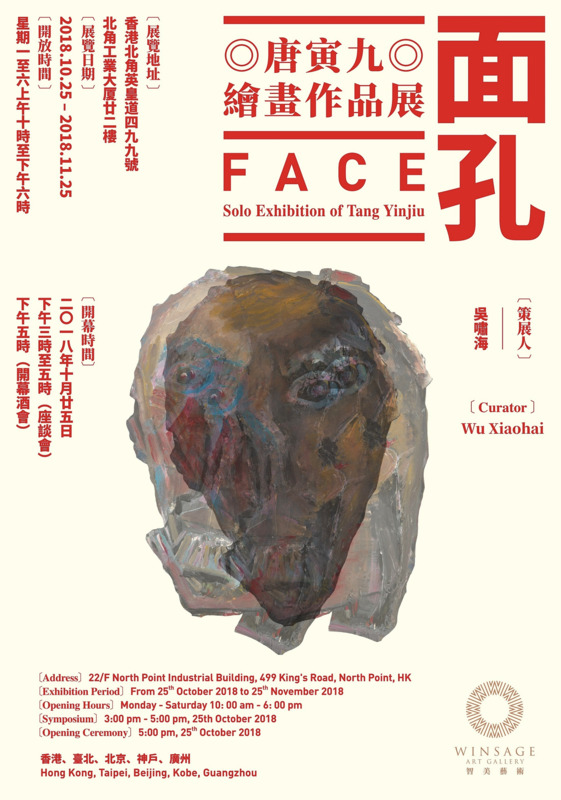 Winsage Art Gallery is pleased to present the upcoming solo exhibition: "THE FACE of artist Tang Yinjiu" on the 25th October 2018 at Art Space 22. Winsage Art Gallery has invited the founders of the Leonardo 3 Museum: Massimiliano Lisa, Mario Taddei, Edoardo Zanon and many others to celebrate the opening ceremony that will facilitate an unprecedented exchange of ideas. Massimiliano Lisa, chairman of the Leonardo 3 Museum, will make the journey to Hong Kong from Milan specifically for the exhibition. The invited guests, which include Massimiliano Lisa, Mario Taddei, Edoardo Zanon. Ma Yuan, Wang Yefu, Liu Ke and Tang Yinjiu will be in Hong Kong from 25th to 26th October included. Media are welcome to make appointments for interview. 2008 Published his novel Self-Inflicted Setbacks《折腾》which was Best Saler of the year in Sina.com and Sohu.com. 2009 Began his oil paintings, he was guided and inspired by Mr Yan Zhilin, a master of oil painting and professor in Central Academy of Fine Arts and Mr Dai Shihe, an oil painting artist and specially Mr Wu Xiaohai, an artist of contemporary art. 2010-2015 Focused on his voyarge (voyage of art) in all kinds of galleries and art institutions in Europe and was deeply influenced by expressionism and abstract expressionism. His works are also collected by collectors in Austria, USA, Japan and many other countries. 2017 Tang moved to Hong Kong and focused on the writing and the painting. 2018 Published his novel A Small Piece of Cloud《一小片浮雲》in China Writers《中國作家》which gained a lot of positive comments. In the same year, Tang published his long novel The Hanging Chair《懸空的椅子》in Phoenix Art Publishing House. Wu is a professor of Mural Painting Department at China Central Academy of Fine Arts. In 2011 and 2012, he made his art voyage to Camberwell College of Arts in London as a visiting scholar. After that, he went back to China and founded ‘The Gecko’ graffiti group in 2013. It is an online platform to call for non-professional artists to create graffiti arts in Beijing and other cities. In 2015, he founded ARTLINKART Centre in Beijing to promote Chinese contemporary art, he was selected as the Top Ten Best Artist in The World for the year 2008 by the famous French art magazine “Beaux Art”. Massimiliano Lisa has been in the media world since 1986 as a publisher and creator of magazines, books, multimedia products and television productions. He is a journalist and has written hundreds of editorials on technology, digital video and multimedia. He is an expert in all editorial and communication dynamics. He received the SMAU Journalism Award for the television sector and the Telecom Italia Award for innovation in the dissemination of cultural heritage. Since 2005 he is main founder, managing director and president of Leonardo 3 (http://www.leonardo3.net/en/the-museum/). Mario Taddei, one of the founders of Leonardo 3, has been studying and researching Leonardo da Vinci since 2004. A graduate in industrial design at the Milan Polytechnic, he has devoted much of his work to the study and development of interactive multimedia products for the dissemination of edutainment science. He won the prizes for the research concerning the machines of Leonardo and those of the Arab scientist Al Muradi and the result of his discoveries won worldwide resonance. Besides, he accomplished the reconstructions of Leone Meccanico and L'Aquila Meccanica di Leonardo. Edoardo Zanon, one of the founders of Leonardo3, has been studying and researching Leonardo da Vinci since 2004. He graduated with honors in industrial design at the Politecnico di Milano, he was a professor dedicating a large part of his activity to the study and development of interactive solutions for the dissemination of science; based on these solutions, he has created products for Italian and foreign museums and institutions. He has received numerous awards and wrote many books. Besides, he is the author of the reconstructions of the Great Nibbio, Clavi-Viola and Leonardo's Fast Balestra, as well as those of the machines of the Arab scientist Al Muradi. He edited and created the largest collection ever of musical instruments produced by Leonardo, which is now kept at “The World of Leonard Da Vinci” in Milan, Italy. Winsage International Group is an art institute centering on providing innovative, forward-looking and comprehensive services to the art and cultural industry. We take the value of art and culture as our core, the protection and development of culture as our mission and safeguarding the interests of clients as our direction. With our professional service and exceptional competence, we fulfill the wish for art collection and investment of all parties. Headquartered in Hong Kong, Winsage International has also branched out to major cities in Asia and around the world. With our global vision and innovative models, we plan our business and its branches with sound strategies. In the international art and cultural industry, the service of Winsage International Group covers global accreditation, private purchasing and auction, artwork warehouse management, art finance and investment, auction item mortgage, artwork collection and investment planning, art clubs and salons, museum and gallery assessment, exhibition planning, overseas real estate investment and immigration, etc. Currently the art investment under the management of the company reaches over USD 2 billion. Winsage Art Gallery, a subsidiary of Winsage International Group, is a comprehensive arts organization that is dedicated to the promotion of artists, the planning of art exhibitions and the development of art derivatives. Adhering to the service concept of “making art worth creating”, the company spares no effort to discover and support contemporary artists with great potential. By bringing together the elites of the art sphere, the media industry, and the public relations community, Winsage Art Gallery is devoted to establishing an art service system with a professional and global vision. The “Art Space 22”, which makes up nearly 6,000 sq. ft of exhibition space in Hong Kong, focuses on international cultural and artistic exchanges and collaborations. Through exhibitions, academic exchanges and more, it strives to build an interactive platform between domestic and foreign artists, institutions, and the general public. WINSAGE Art Gallery will be based in Hong Kong with a professional and open style and, as further development opportunities present themselves, will gradually expand its influence throughout Asia and the world.